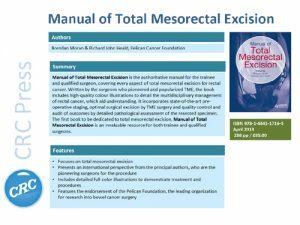 Total Mesorectal Excision (TME) is an operation that today nearly all rectal cancer patients will undergo. This procedure has changed rectal cancer outcomes across the world. TME is precise surgery – the surgeon takes his/her time to meticulously remove the part of the bowel where the tumour is sited and include all of the surrounding tissue (the mesorectum). It is evident from pictures of the tumour specimen after surgery when this has been successfully achieved – when the surgeon has carefully followed the ‘planes of surgery’ and removed the tumour with a complete outer layer. When the specimen is irregular or damaged then the ‘margins’ may be compromised – this can lead to a recurrence of the cancer as cells might have been released into the body. View a surgical video of TME. 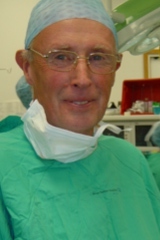 The TME technique was developed by Pelican’s founder Professor Bill Heald at the Hampshire Hospitals NHS Foundation Trust’s Basingstoke Hospital, and is recognised as the ‘gold standard’ in rectal cancer surgery worldwide. It is now adopted by surgeons across the UK, and in Norway, Sweden, Denmark, Holland, Germany, Austria and Switzerland. The technique has become standard terminology for optimal treatment of pelvic cancer all over the world. Prof Heald and colleagues at Basingstoke continue to teach, run meetings and speak about TME across the world. Now there is also a book: The Manual of TME, which reflects this team’s motto of ‘precise surgery combined with a passion for doing things better’. Pelican also supports current research making advancements based on these surgery techniques. See the recent grants for bowel cancer for more information.